is escapeVektor a thrilling arcade game or will you want to escape from this game? In escapeVektor you take on the role of an anonymous person who must help a person who has been digitized and held captive by an evil computer while helping him regain his human memories! The story is simple yet clever and is a nice addition to this simplistic yet challenging arcade game! The gameplay in escapeVektor is simple you must move along set lines and grids while avoiding enemies and hazards such as electric fences the object is to traverse the entire grid changing its color once completely explored the level exit will appear? Sounds easy? 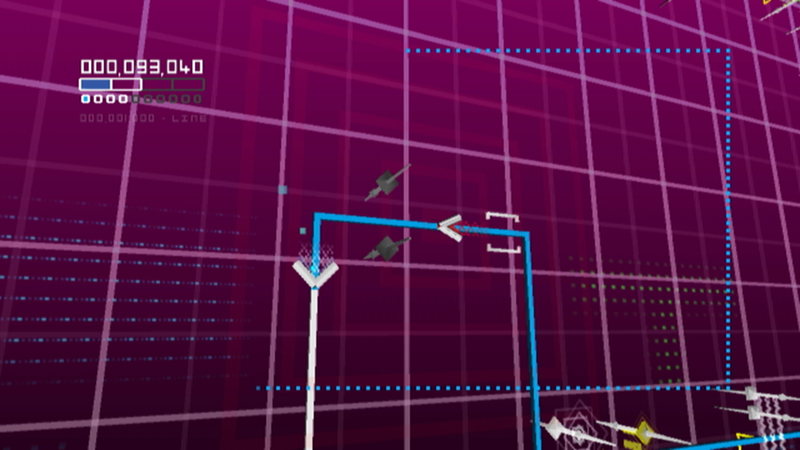 Well it's not as the enemies such as pursuers will hunt you down relentlessly and lets not forget levels that require you to avoid retracing your steps which will actually change the grid's color back to its original color! As you progress through the game you will unlock powers such as the boost and detonation pips that can be upgraded after beating certain levels and will prove to be life savers in many of the later levels! There is some bonus content for those who downloaded Nnooo's first WiiWare title Pop and Nnooo has confirmed that future volumes will unlock even more content in chapter 1! The graphics in this game are very simple and have a level of beauty that few games on the service have and the music is among the best you'll hear on a WiiWare game! Bottom Line-escapeVektor chapter 1 is one of the best WiiWare games I've reviewed so far and has highly polished gameplay,a clever story,and graphics and music that is nearly unparalleled on the service! At 500 points it is a must buy title! Well, I must say, I think you gave this game WAY too much credit, but then again I haven't played it yet, so I don't know. But nice review once again Rukiafan ! I spotted several grammar errors well anyways this sounds like a decent game unlike Pop so I might consider this. @Jnes5 wrote: Pics added ! Yeah, you should experience it first, least ye judge. I would have awarded it around the same score as Rukiafan. Don't put so much thought into this decision Chronobo, just download it. It's a really great game, you can take my word for it. It's only 500 points, so really how much of a gamble are taking here. Your are correct Sir ha! ha! ha! I've seen nothing but good comments on Airport Mania, what is the premise of this title? It's a shame the Magic Obilesk was removed, I say this as an avid puzzler fanatic. I think I heard that Nintendo is going to offer The Magic Obilisk as a Club Nintendo limited reward that only Platinum status members will have the option to receive as a reward. Nice review BTW! Where did you read that Supertimbros? Welcome to wiiwarewave and it is a sweet game Happykat. This is a great game that should be a part of every persons Wiiware library. @Dragons_Rule wrote: This is a great game that should be a part of every persons Wiiware library. How hard is it to beat this game? Please use the escape VeKtor impressions thread guys. Comments and opinions in this thread are to be directed towards the review itself. I don't know why, but I feel like break dancing whenever I play this game lol. Yeah it is Bazooka, Rukiafan deserves all of the credit he receives. I'm sure it is Rukiafan. Even if a member doesn't especially appreciate the review, because they don't care for the game in the first place, they should still bestow recognition. As one day you will write up a review for a game they love, and I'm sure recognition keeps you motivated to present the best reviews you can write. This looks like a fun game for the price. This isn't something I think I would like but regardless your review is good. I thought it was really difficult too Epona until I realized that you can use the detonate at level 7. Now that I have the boost unlocked I'm having much less trouble completing the levels. I always like a challenge.